Collectivism emphasizes the interdependence of people in some collective group and the priority of group goals over individual goals. In the Chinese tradition, collectivism has long meant that an individual does not work to accumulate wealth for himself but rather for his family and for the community. However, as China begins to advance in its developments, it has also seemingly taken a more individualistic road towards its future. The government has slowly begun to reduce its grip on social and collectivist processes and new policies aid in creating a society in which capitalism serves as a leading social value such that personal wealth is becoming increasingly more important than other social values. As Simmel notes in his essay, The Metropolis and Mental Life, there is a dynamic or dialectical tension between the individual and the society. For him, the greatest dilemma of modern society is that it frees individuals from historic and traditional bonds for greater individual freedom, yet at the same time, individuals are also experiencing a great sense of alienation within the culture of urban life. In big cities such as Hong Kong, we are constantly bombarded with an inflation of external and internal sensory stimulus: from the sweaty arm of a stranger that brushes against you as you cross the streets of Tsim Sha Tsui, to the overwhelming visual stimulation of signage that covers the view of the sky in Causeway Bay. The metropolis creates rapid crowding of changing images and sharp discontinuity in a single glance that fosters a situation where one must buffer him/herself from a constantly changing environment. This phenomenon can easily be illustrated with the subway scenes of Hong Kong, even though there seems to be little to no sense of personal space, no one seems to be bothered by the fact that there will always be someone brushing against them as they pass by. 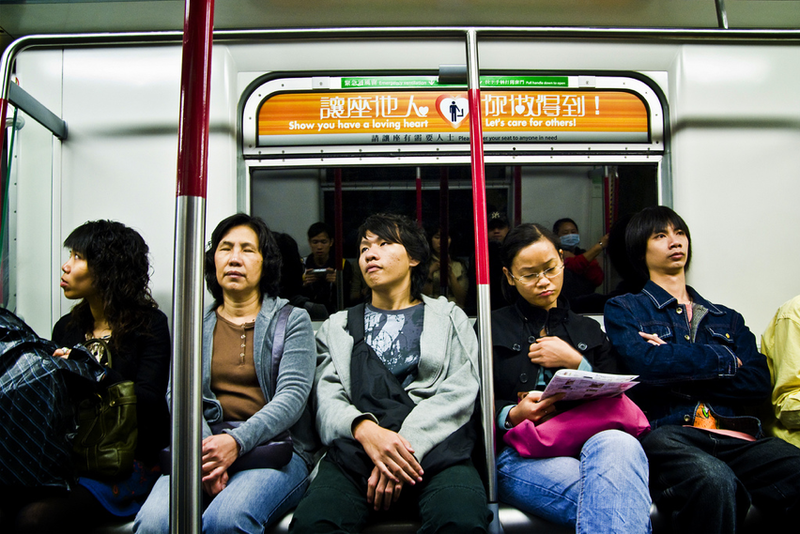 People simply sit quietly and stay to themselves on the subway, listening to music or playing with their smart phones. Everyone seems to be immersed in their own world: disengaged and isolated, tuned out to their bustling external environment. And in turn, this protection manifests itself in the rise of logic and intellect where social interactions become rational and instrumental, with little considerations to emotional and personal concerns. Everything in the city becomes measurable and calculated; qualitative value is reduced to quantitative. Things therefore have no intrinsic value and are instead measured by the external objective value of money, time and power, yielding what Simmel calls “blasé”, a superficial and indifferent mentality to the people living within it. This mentality is also manifested in the built environment around these cities. 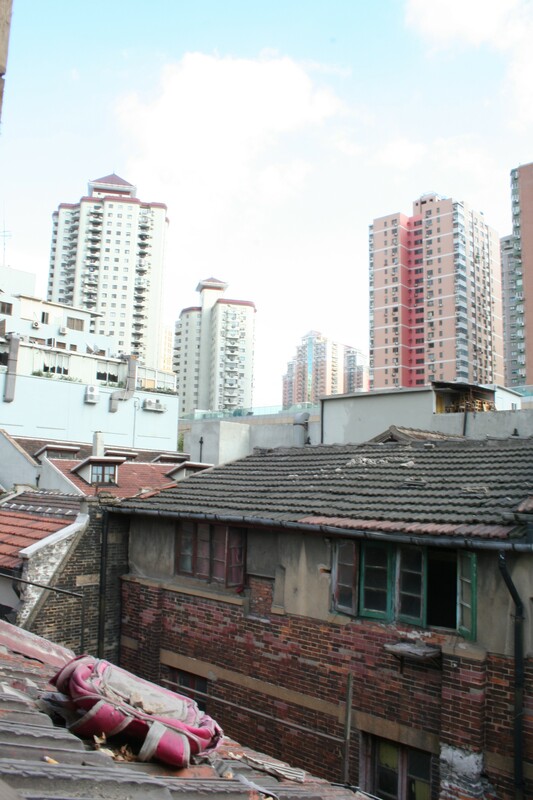 Like the urban village, Huang Gang, in Shenzhen, we learnt that the villagers decided to tear down all the old village houses to construct new 5 to 6 storey buildings with commercial spaces located at the bottom, so that they can rent them out to different tenants for greater revenue. Little of the old fabric was maintained, and instead is replaced with generic looking low-rise village buildings, commercialized to maximize profit. Another example of this mentality is visible through the restoration efforts of the BaoMo Garden in Panyu. Described as “one of the new top eight sights in Panyu” on its information pamphlet, this “National class AAAA scenic spot” has been restored to the point where nothing seemed authentic anymore. In fact, it almost felt very theme park-like – with traditional Chinese music playing through the speakers located everywhere in the garden, the out-of-place European street lamps, the flashing light bulb eyes for the stone dragons that spurt water out of their mouths, and the vendors that tried to sell you souvenirs and fans at every turn of the corner – everything about the place was so marketed and commercialized that it seems to have somewhat lost its sense of cultural heritage. However, in spite of all these consequences of individualism, there are still efforts, such as the Urban-Tulou by Urbanus and the “Di Wu Yuan” housing development by Vanke, made to reinstate the sense of collectiveness within our society. 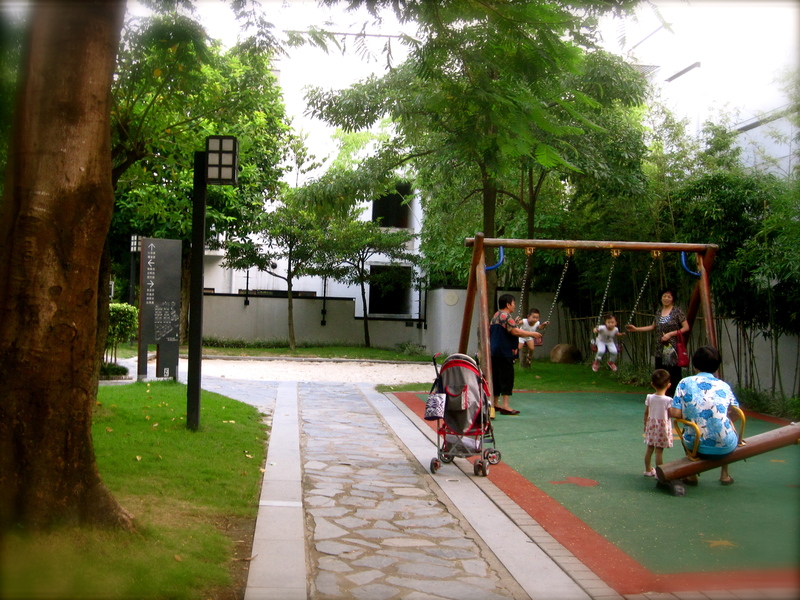 These projects are designed to help preserve community spirit among low-income families by inducing greater opportunities for social interaction through the attention paid to the design of their public spaces. According to Urbanus themselves, the Urban-Tulou project also explored ways to “stitch the tulou within the existing fabric of the city”. This idea can be illustrated in the way the project comes in contact with the ground plane – by lifting the housing units on the first floor to free the ground floor for through-access commercial uses, it allows the spaces to be accessible to both the residents of the project as well as the community around it; expanding the sense of collectiveness to the greater community. It is always nice to see projects such as these that are made to induce collectivism within a seemingly individualistic modern society where everyone is preoccupied with work and with the accumulation of personal wealth. One can only hope that the idea of collectivism in China will not be left behind at the expense of the accumulation of wealth, and that more projects with an agenda on community spirit will be developed in the future to counter-balance the forces of individualism. Major Chinese cities like Shanghai and Beijing have seen an exponential growth in their population since the advent of farmers and rural people moving into the city. Because of this increase, developments of housing and retail have taken priority over much of the old fabric of these two cities. Robert A.M. Stern’s Urbanism is about Human Life advocates reusing cities and make them better rather than making new ones. The decision to preserve the Hutong [Beijing] and Lilong [Shanghai] given them a new life geared towards tourism and higher property value. Places like Xintiandi [New Heaven Earth] and Tianzifang in Shanghai have a historic allure that draws the tourists and wealthier Chinese. However, Xintiandi has been revamped to an area where tourists want to stay, while Tianzifang is the remaining old fabric that tourists visit. 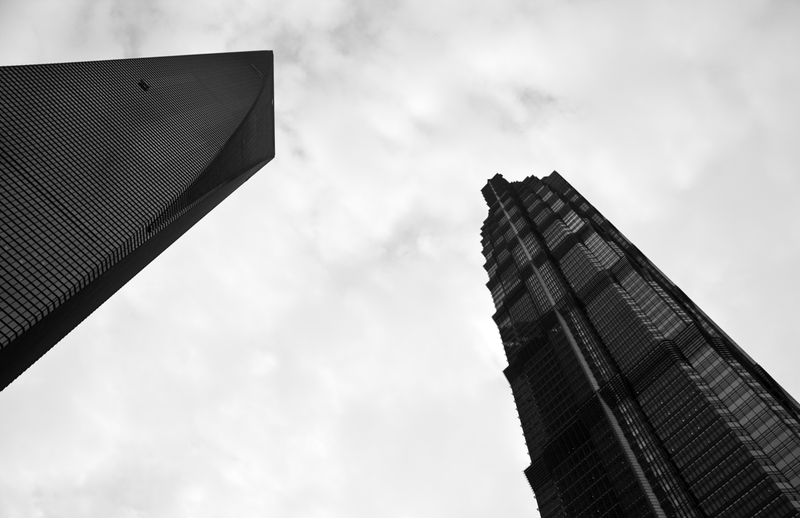 When looking at the growing fabric of Shanghai, Tianzifang sticks out like a sore thumb with its complicated, disorganized, and densely compacted structures surrounded by new massive housing and retail developments around it. Despite its age, Tianzifang strangely works with the growing environment around it because the intimately scaled Lilong mediates the overcasting structures looming near it. Upon entering Tianzifang, I was greeted with a newly completed shopping mall that had a sky bridge stretching across one complex to another, framing the smaller scaled Lilong of Tianzifang. 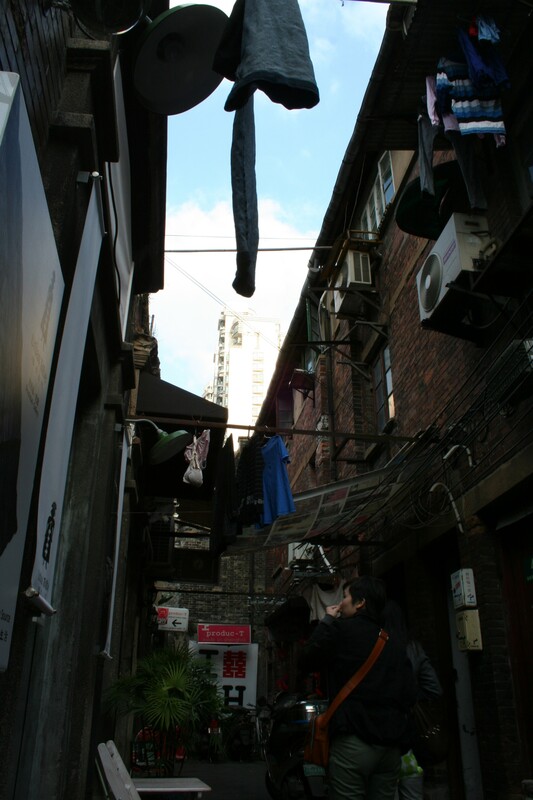 Tianzifang had small boutiques, cafes, and restaurants lining the first floor, but around 5pm, the smells of food permeate through the alleyways as the residents who live above the shops prepare for dinner. Walking through Tianzifang, my vision was focused on the street and where each arm would take me. Some led to dead ends, while others led to the smaller alleyways with overhead cafe’s and restaurants. The scale of these buildings were around 3 stories tall, but the floor heights were around 7-8′. The width of the alleys [especially those without bikes] did not exceed 8′. The scale proved to be effective in concentrating all the views into the alleyways, surrounding and transporting me into a completely different world. There were a few moments when I was able to see the office tower or the housing structures, but they were mediated by the scale of the Lilong to show only the top portion of the building. This made the building seem like it was floating in the air and even more like I was in a fantasy world. I continued to wander the alleys for another because Tianzifang relieved me from the megablocked and fast paced city into a more scaled down, digestible, and relaxed setting. Because the open plaza’s scale is proportionate to that of the high rise towers, it fails to serves its purpose as a relief space. Rather, it makes the user feel trapped and surrounded than free. The Lilong, with its limited amount of walking and pubic gathering space used the scale of the open sky to offset its compacted nature. I had the opportunity to explore one of the units that was currently being renovated. There was a small small room that was for receiving people and had a centralized stair. As I proceeded up the stairs, rooms and balconies branched off from the circulation. I went towards the second level balcony to see what the view was, but a 7′ wall blocked my lateral view and focused my attention towards the sky. Even within each house, the view was introverted. However as I proceeded to the third floor balcony, I saw the rooftops and housing towers rise up. This was the first moment since walking into the Lilong that I could see the extent of the developments that were surrounding it. When the Lilong was designed, it could not have possibly planned for this sort of future with towering developments and shopping malls. Tianzifang’s introverted focus successfully filtered the overbearing surroundings and managed give itself a new second life. Having spent almost two months in China by now, I have witnessed on a daily basis the remarkable extent to which this nation is growing. Three times a week I ride the world’s most extensive subway system into the city center for studio. By 2020 the system is projected to double in size. Last month I attended the Shanghai Expo, which drew more people in five months than any other in history. On one day in October, over one million people flooded its grounds. In Beijing I visited the site of the 2008 Olympics where the Chinese government spent roughly 40 billion dollars, over twice the expenditure of any other Olympics in history. And just last week I viewed Shanghai form the world’s highest observation deck atop a Pudong skyscraper. Within a matter of two years it will be substantially eclipsed – by a building under construction across the street. If it sounds as though I am belaboring my point, that is my intention. Economists no longer debate whether the PRC will surpass the United States in economic might, but whether this will occur closer to 2030 or 2040. Political thinkers no longer debate whether China is the next world superpower but whether, once fully developed, it will eclipse the United States in its military dominance and space exploration. All of this is sure to guarantee the next few decades of global politics will be endlessly fascinating, and no doubt a bit scary for Americans content with the current world order. But one question keeps coming back to me every time I consider China’s development: what is it all worth? That hundreds of millions of people will rise from poverty level to the middle class is a victory for all of humanity, but will individual Chinese born into this newfound wealth be better off for it? If precedent is any indication, the answer is not as simple as we may like to believe. Citizens of developed countries across Europe and North America have access to the kind of wealth, education, healthcare, and opportunity that rural Chinese now seek for their children. Despite this, disenchantment with the human condition persists. One in ten Americans suffers or has suffered from depression according to WebMD. And Medical News Today reports that 40 million Americans deal with anxiety and stress on a daily basis. Are the children of the Baby Boom generation, born into a Post-War era of phenomenal growth in the United States, any happier as adults than their parents who lived through the Great Depression? By comparison will Chinese children of today, born into a country on the verge of developed status, find a great deal more fulfillment in their lives than those who came before them? My suggestion is not that the answer to these questions is no, but that increases in wealth and technology elsewhere have often introduced as many problems as they have solved. Beijing’s 798 is one of China’s contemporary art districts supported by a broad range of art galleries, cafés, artist studios, bookstores, and shops. Before entering 798, I considered the irony of Beijing, being the capital of Communist China and control center of censorship, allowing social commentary charged art to be displayed. Upon entering the first gallery, every piece of art had commentary on Chinese culture, past and present. I continued through 798, and immediately stopping the Cuba Avant-Garde art show. After seeing waves of galleries displaying Chinese artists, why was it that Cuban art was able to make it to 798? I wandered into the Xin Dong Cheng art space seeing a various display of Cuban art, understanding that most pieces had a social commentary on the Cuban socialist government. I was drawn to Rene Francisco Rodriguez pieces because of its simplicity, but its high attention to detail. 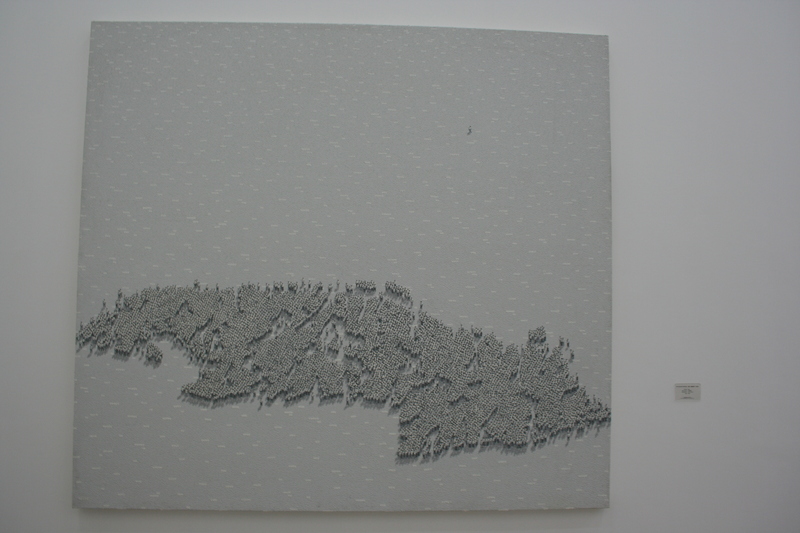 This first piece displays a monochrome composition of people forming the Cuba with a stray figure wandering off to the right corner. 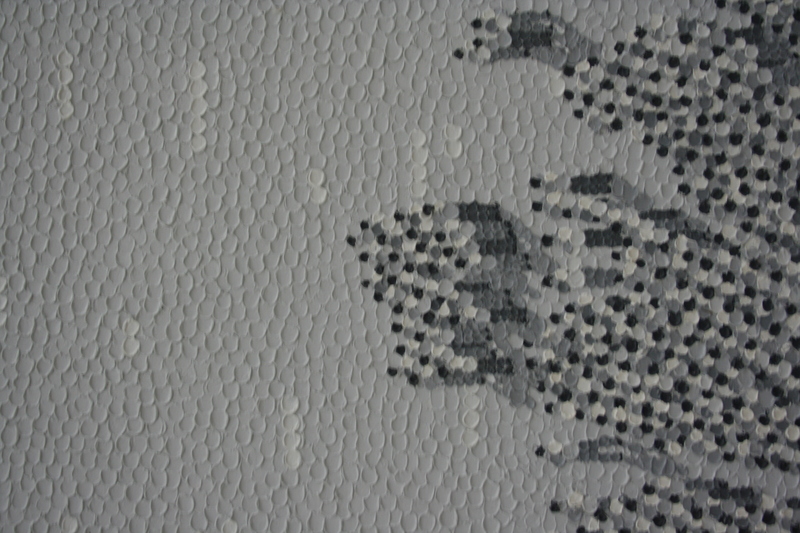 Upon looking closer at the drawing, everything was composed of Q-tip sized dots for each person’s head, body, and legs. Rather than painting the background gray and dotting the people in, the artist painstakingly dotted every square centimeter of the canvas, making it impossible to ignore his intention for doing so. The dotted paint seemed to represent the idea of socialism and everyone being equal. From far away, the picture appeared as a nicely shaded island of Cuba, indicating the country as a whole unified piece. Looking closely, the human figures appear to illustrate that Cuba is composed of individuals for the same good of socialism. However, what about the Stray veering off to the right? Socialism on paper seems like a viable political concept. But in reality, not everyone is content with its agenda and outcome. Equality is great, but how much do you have to give up in order for everyone to be at the same level? How much are people willing to sacrifice for the common good? The stray figure symbolized the individuals who weren’t able accept the socialist Cuba and left for another life, deeming themselves as outcasts of the whole picture of Cuba. Perhaps the author sees himself as this single person, using art as a way to display his feelings towards Cuba’s communist regime. From this analysis, I started to draw connections to China. The most obvious similarity is their communist government. Both countries underwent a transformation that affected the overall lifestyle of their citizens and many fled to other countries to pursue a better life. However, since then, China has had a different interpretation of Socialism than Cuba and has yielded extreme development results. Cuba’s growth has not evolved to that of China’s and perhaps gives many individuals like the artist frustration that the whole country can’t seem to progress further. It may have also been the intention of the curator to show very subtly the uncertainty and perhaps negative aspects of communism through the Cuban lens. 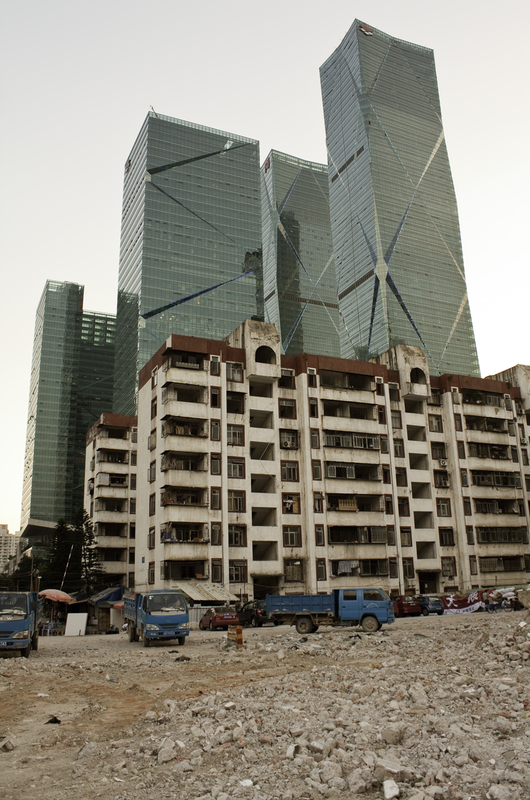 Looking at China’s fast pace of development, there is a mix between Communism and Capitalism. Few would say that China is completely socialist, but many policies like the lack of land ownership still remind people of its overarching communist stance. In America, we pride ourselves for having freedom of speech and press, but when these rights are challenged, there is a notion that people don’t necessarily have the liberty to express their opinions. We also pride ourselves on democracy, which is seldom seen because few policies are decided to benefit the people. As a communist country that has extreme censorship and human rights issues, China has been able to benefit its people with infrastructure, while America the Free is busy with airline companies lobbying against high-speed rail. The rate of progress for China has increased exponentially while the United States’ has slowed to a snail pace if not halted in the past decade. The Stray in the painting is leaving Cuba, but where is it going? At this point the communist/capitalist hybrid system of China produces results while the United States, which advertises freedom and democracy, is stuck in a development slumber. Will the stray turn back, go to a country that has a similar system, but yields results, or a country that “promises” liberty? As a result of the 1997 Sino-British Joint Declaration, contemporary governance in Hong Kong has much in common with Western nations. A market driven economy and personal liberties are key components of the ‘one country, two systems’ resolution, which is to last until at least 2046, fifty years past transfer of sovereignty from the United Kingdom to China. What happens after this is anyone’s guess, but for the time being freedom of press guarantees uncensored media, a highly effective guard against government corruption and abuse of power. Ditto for free speech and assembly, which empower residents to organize and voice concerns in a democratic manner. With the exception of Hong Kong’s Chief Executive, who is appointed by Beijing, all political positions are subject to popular vote and the people’s universal suffrage mandated by law. Yet despite Hong Kong’s freedoms and high quality of life, Chinese increasingly view the territory and its politics as passé at a time when freedom and opportunity of the economic variety exist to a far greater degree in dozens of booming mainland cities. Shenzhen is directly adjacent to Hong Kong on the mainland and has grown from a farming village to a city of 15 million over the last three decades while its neighbor has remained practically stagnant. The question this begs is why would any profit-seeking developer consider working in a city that protects 75% of its limited land supply and subjects every project to environmental scrutiny when he could simply negotiate with politicians to build the same thing faster and cheaper on the mainland? China’s rapid industrialization, abundant land supply, lack of bureaucracy, and ballooning middle class create an unparalleled opportunity for profitable development and constitute a new kind of freedom unmatched in the Western world. From Steven Holl’s Vanke Company Headquarters in Shenzhen, to OMA’s CCTV in Beijing, and a host of other Chinese projects commissioned to European and American architects, the pull of this new freedom is something Westerners must now reconcile. A black and white reading trumpeting the benefits of liberal democracy and the downfalls of communism (or quasi-communism, as in the case of China) leaves out a grey area in the middle from which we have much to learn. A heavy-handed centralized government has brought hundreds of millions of people out of poverty in China, and we as Americans would be obstinate to avoid considering the merits of such an approach, or at the very least using it as a springboard for a bit of national reflection. Exactly what constitutes freedom or a high quality of life could be argued in much the same subjective manner as the architectural merits of a building or the urban merits of a city, and there’s nothing quite like a challenge to the status quo in spurring progress. To simply remain complacent and ignore this challenge altogether though is one mistake the United States cannot afford to make. We had the privilege to see Kenneth Frampton at Hong Kong University, and the following is his main points about urbanism and the megaform. Frampton critiqued, analyzed, and demonstrated many different forms of megastructures located within larger city plans, and what their role will be in the future of urban development. These last ten points help summarize the ideas covered throughout the lecture, and give an understanding of the challenges for urban designers and architects.